The overwhelming market share proves our reliability and technology . . . Incorporating KGK's cutting-edge technology, IFD-2300 offers quick and accurate flame detection quality with three infrared wavelengths. With round-the-clock unattended monitoring system, IFD-2300 accurately distinguishes flame from sunlight both in and outside the building. Another version of the product for use in tunnels is also available. 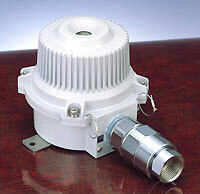 We sell not only the flame sensor for the explosion-proof treated but also the single piece of sensor module. With a dominant share in Japan, KGK's widely used flowmeter for fire-fighting pump trucks secures appropriate volume of water regardless of hose condition. Working with the totaliser gauge, the flowmeter tells you an accurate volume of water used.